The backs of the cards feature floating spheres that pop off the card. Grey spikes and cracks surround the background and a red wave spirals into the center of the blue abyss.The face cards are saturated in a blue and red glow. You can tell they have been awake for days. The numbered cards illuminate from the center. The pips are custom with black borders and colored centers. 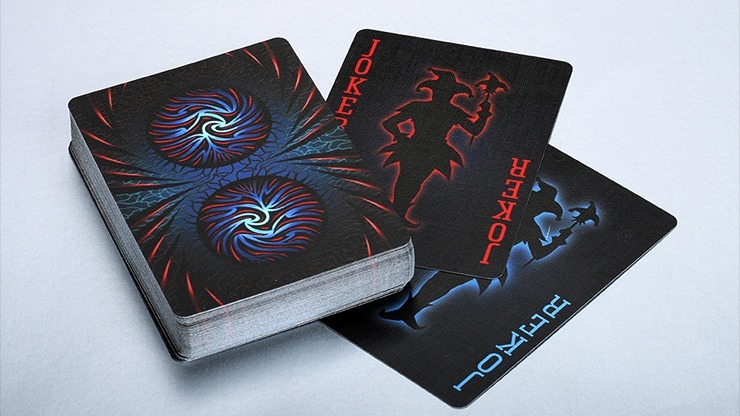 The Joker cards are a silhouette of the jester himself against a jet-black background.